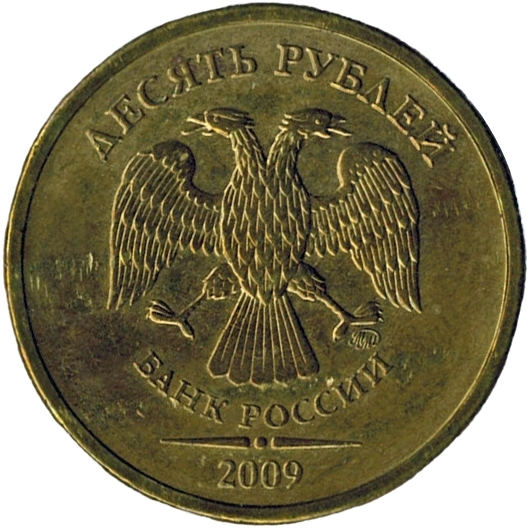 In the centre, the emblem of the Bank of Russia (double-headed eagle with open wings), underneath which is the semicircular legend "БАНК РОССИИ" (Bank of Russia). To the right, under the talon of the eagle, is the mint mark. 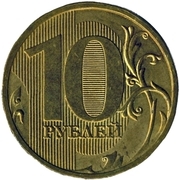 At the top of the circle is the denomination: "ДЕСЯТЬ РУБЛЕЙ" (Ten Rubles). At the bottom are two horizontal lines separated by a dot; under them is the year of issue. 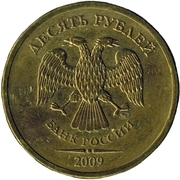 Denomination in the centre, on a background of vertical lines, underneath the word "РУБЛЕЙ" (Rubles). Floral design in the form of branches with intertwining stems along the edges. 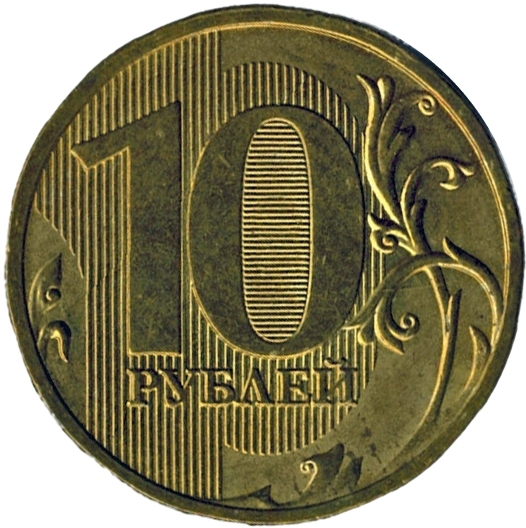 Latent image inside the number 0, seen differently depending on the viewing angle: the number 10 and the inscription "РУБ". Segmented reeding: six coarsely and six finely reeded segments (5 and 7 embossed bars each) between twelve smooth segments.